Okay, enough about the plot. I found the writing to be rather heavy on the description but I didn’t mind. I read this book in a day—and I wanted to finish it, which is more than I can say about a lot of books I’ve been reading lately. I wanted to find out if either Grace or Mandarin came to some life-altering realization about life. (view spoiler)[I guess they do. I was more satisfied with Grace’s ending than Mandarin’s but I will NOT spoiler the ending for you. 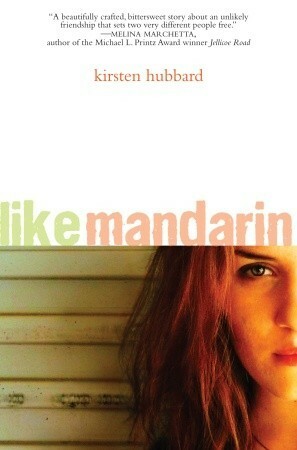 (hide spoiler)] Throughout the story, I was more fascinated with Mandarin than with Grace. This book suffers from Secondary Character Syndrome—when the side characters are more interesting than the protagonist. John Green seems to want his books to have this affliction. (Tiny Cooper, Alaska, Margo Margo Roth Spiegelman) Anyway, I wanted to know more about what made Mandarin the way she is. Her story seemed like it was begging to be told but he could only grasp onto small bits of it through Grace’s perspective. It was frustrating. +I really didn’t feel Grace’s alienation from her mother. +Why didn’t anyone in the town try to help Mandarin if all these men were sleeping with her? Especially when all she had was her father and he didn’t care. It seemed like it had been going on for a while. +I thought Davey was a rather ridiculous character. I’m a little embarrassed to say that I thought he was mentally other-abled for a large portion of the book. What was the point of his presence in the book? I was kind of hoping he would be proof that nice guys did exist in Washokey but that one never really crossed the finish line. I find it rather amusing that I read Unearthly last week and remarked on how few books are set in Wyoming. What are the chances that I'd read another in the same week? Like Mandarin is set in Washokey, a fictional town that seems to be located in the Northeast corner of the state. (Just about every town in Wyoming gets a mention but I couldn't pin it down) Kirsten Hubbard describes the town, environs, and weather in such a way that I could absolutely picture it all in my imagination. Then again, I've been through that area of Wyoming several times and I think seeing some of those tiny towns in the middle of nowhere really helps form the picture in my mind. Even if this book wasn't my favorite, I'd really enjoy reading more books set in this town from the author. Sign into Goodreads to see if any of your friends have read Like Mandarin. Uh-oh! I had high hopes for this novel.. I mostly thought it was boring. Not necessarily bad. Ok. Off my list (it had been shifted already to the just-remember-list). Nic--maybe you'd still really like it? Most of the reviews seem to be 4 and 5 stars. I just didn't find it particularly engaging. The secondary characters were more interesting than the protag, which is a huge annoyance to me. [For me it's a] 'No' [edit: I see now, you addressed Nic, not me]. That and Tatiana's "boring" hint are sufficient. I can always stuff it back onto my list, should somebody I know rave about it with believable enthusiasm. Boring plot and uninteresting characters are a deadly combination as far as my taste in books is concerned. You are right, Flannery. The protag was very weak. I wish it were more about Mandarin herself. I'm seeing the Alaska effect. The main character is way more interesting than the protagonist huh? Definitely. I was so much more interested in what was going on in Mandarin's life. She was mysterious in the same way that John Green's (female interest) always is and Like Mandarin's protag was blah in the same way Green's sometimes are--but he is funny enough to make it work. I think both of them are strong writers. I just wasn't very interested in this story. @Olivia--I actually was talking to you in that second part:) I just addressed that first part to Nic. Oops! I will probably wait for more a couple of more reviews then decide. I definitely think it would work for a lot of people. I bet at least a few bookers would give it 4 stars. I'm not that interested (at least not enough to purchase a hard cover) as I'm thinking it *may* be too word-y (in that literary, purple-prose-y, metaphor-ish, simile, etc ~ you get what i mean) way. I've read a few quotes and while I liked the rhythm and sentiments in them I sometimes get bored in books that are more prose-y than plot. I feel like I am not making much sense. Argh. Nomes, I know exactly what you mean. The prose here is overwrought. Hmmm. I was actually really looking forward to reading this because someone compared it to Marchetta's books ... Doesn't sound like that was a good comparison. Flannery, did you actually understand why Mandarin was so promiscuous? I didn't think the fact that (view spoiler)[her mom left (hide spoiler)] was a reason enough, at least it wasn't explored properly. Tatiana wrote: "Flannery, did you actually understand why Mandarin was so promiscuous? I didn't think the fact that [spoilers removed] was a reason enough, at least it wasn't explored properly." You know I couldn't resist clicking that spoiler button. That's all? Seriously? I was expecting something more...I don't know...harsh? I mean, that could be a small part of why she's the way she is but not the entire reason. Like with Alaska Young, I believe watching her mom die and feeling responsible for it made her the person she was. The more I think about it, the more I feel like the problem here was a weak main character. A lot of books are about "regular teenagers," and I know not ever character has to have quirks. I feel like Grace didn't have enough personality--honestly, it felt like she (1)was a good student; (2) kinda sorta wanted to leave town; (3) collected rocks; (4) obsessed about Mandarin. I agree, for a protag she wasn't interesting at all. She didn't even obsess over Mandarin enough to make her more exciting. Either way, I still feel the supposed reason for her behavior wasn't strong enough or wasn't written strongly enough. Did you read Paper Towns? I felt like this book was very similar in that the main character obsessed over an enigmatic girl who turns out to be rather mundane when it all comes down to it. Yes, I have. Margo turned out to be a tad emotionally unstable (sort of like Alaska). But I thought JG's books were much better. They definitely are. I loved Alaska when I read it. You're right that, when it all boils down, this book was okay but it wasn't anything special. The only part that I connected with was the description of the town. Hmm . . . Lately I've been looking for more YA contemporary to read, but this may not be for me . . . I'm with you Lora. I want more YA contempory, I dont' think I'll add this though. Great review Flannery! I want at least one other booker to read it to see if they like it more. Someone take the bait! Flannery wrote: "Nomes, so you're promising to read it a year from now? lol. I'd mail you a copy but I don't really rec the book so it'd be a waste:-/"
I'd read it right now. How does bookswap work anyway? But you really don't know how the swap works, Cory? Sometime this week I actually want to go through and list all the books I have around the house. Maybe you'd want some of it. Hmm. Anyway, you go to the swap part of the site, see a book you like and hit request book. The owner says okay, then you pay for shipping and the deed is done. It's usually like 2.50-4.50 to mail it. But you really don't know how the swap works, Cory? Sometime this week I actually want to go through an..."
Ah...I used to use paperback swap, but their system is unreliable at times. You actually pay to ship the book to other members with them. I'll probably wait and buy the book too. No sense in waiting for my library to get it. It'll take them three years. That's a bummer. About the library, I mean. Flannery wrote: "That's a bummer. About the library, I mean. I used PBswap a few times but I thought that part was annoying. I actually love GR swap though I've only used it a few times. It keeps your info so you..."
Sounds much better indeed. If you want a book, you should pay for it. PBswap actually calls it fraud if you refuses to ship a book too many times. I just swap books with Nic* ((hugs)) we send the parcels to each other ~ only pay postage. It's good as often we swap 3 books for 3 books, etc. Oh and better world books is *really* good. they ship new and second hand books for FREE. Have bought some second hand books from them and they have been in good condition so far. most second hand is around $5 ~ 6 for paperback. I've never heard of them. I'll have to check it out. I wish TBD would send us Aussie books to the US but they won't (obvi) if they aren't released here. I want free shipping! Betterworld is one of the sellers on Amazon. A charity organization, I think. I do not know how it works with their shipping, but the parcels are usually stamped in Indonesia or India or somewhere else. And it takes time - to ship to Europe anyway. Around three weeks.